The Fuente Rosado Magnum R appeals to cigar lovers who enjoy a creamier and smoother cigar experience without sacrificing flavor. 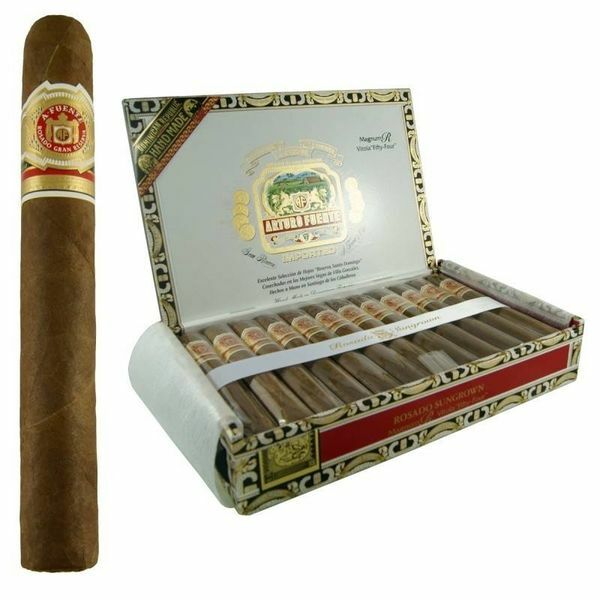 With a distinctive, sweet finish and elegant, complex undertones, this cigar is destined to become another Fuente classic. Enjoy! At a time when tobacco companies were producing full-bodied cigars, Carlos “ Carlito” Fuente Jr. took a new direction and produced the Arturo Fuente Rosado Gran Reserva Sungrown Magnum R, a medium bodied cigar, but one not lacking in intense flavor. When shopping online for high quality and affordable price, do yourself a favor and pick up a box or two. Rosado (Spanish for pink) refers to the rosy toned wrapper which is aged for nearly a decade. The Ecuadorian Sungrown matched with Fuente’s blend of Dominican filler and binder creates a mild to medium bodied perfectly constructed cigar. Rosado Gran Reserva Sungrown Magnum R is bursting with flavors of dried fruit, maple, pinenuts and spice. There are subtle undertones of leather, cream and cedar. The smoke is not too heavy, but not lacking flavor or body. It is a touch sweeter than other Fuentes, but it remains complex none the least. Rosado Gran Reserva Sungrown Magnum R makes for a good companion when travelling. The mellow hour long smoke makes a long road trip more tolerable. The sweet, fruity Rosado Gran Reserva Sungrown Magnum R pairs well with lighter bodied wines. French rosé from France’s Provence region paired particularly well on a warm summer day at the beach.